Radio Ballad No 6 - Parker, MacColl, Seeger, etc. 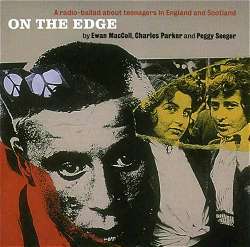 On The Edge, the radio ballad about teenagers in England and Scotland was broadcast by the BBC in the early 1960's. When I listened to the Topic Records reissue today, thirty-odd years later, I heard in it parts of conversations I had with young people last night. I was a teenager at the time of On The Edge's broadcast and I have spent about two thirds of the intervening years working with teenagers, many of whom have felt themselves to be on the margins of decisions which affect them. Most have a vision of the world they think is barred, or at best compromised, by the obstacles of family, looming responsibility, social structures and convention. It's because of this background that I was asked to review On The Edge. I'm no student of folklore and have only a modest knowledge of indigenous song style. On the other hand I have a very high regard for the work of Peggy Seeger and Ewan MacColl whose great warmth to my family I remember after some brief meetings years ago. In other words, I am ill-informed and biased, as well as being partial to the form of the Radio Ballads. But does this one have truth in it? I used the word convention when listing some of the things some young people feel to be obstacles deliberately, and probably because I was too nervous, in this context, to use the word tradition, but I have had mixed feelings about this very thing for some time. It is interesting that Ewan MacColl was known to be no great fan of Bob Dylan, yet Dylan, at round about the same time as this recording, seemed to articulate a scream from a generation which wanted to change the world rather than inherit it . " ... Your old road is rapidly changing ... " was followed by a full blooded cry for the older generation to move out of the way and let the young take the steering wheel. In his commentary on the Radio Ballads, Laurence Aston reminds us that soon after On The Edge and in the wake of the Beatles' first number one hit, young people were to be the focus of everyone's attention all over the world. Very true; and they were on the brink of Vietnam war protest, Woodstock and a cultural revolution which has twisted, turned, changed and developed over the years and shows no sign of slowing down. Young voices are louder in our world than they have ever been before. The institutions which interact with the young reflect this too. Classrooms are generally arranged so that students sit facing each other, encouraging the sharing of ideas rather than front facing to receive them. In my own work there is a constant request from decision makers for the opinion of young people. All this would seem to make the comments of Charles Parker dated and obsolete when he talks about the experience of the Radio Ballads team when getting young people to talk. " ... It became dramatically apparent", he says, "that the problem was not to get them talking, but to stop them. Once they were sure of our serious concern, they were away ... giving us the uneasy feeling that for many of them this was a unique experience to simply have an adult really listening!" The reality is, though, that they are neither dated nor obsolete. The key is in really listening and hearing what young people are really saying. It is no coincidence that what I hear from fifty-year-old teenagers in On The Edge are, pretty much, the same things I hear from sixteen-year-old teenagers today. There is a trick we can all do. Sit down with your own children, or borrow someone else's, show them some photographs and chat about who you were and what you felt when you were a teenager. Watch their faces. The chances are that they will recognise you more than you recognise them; they have the feelings, you're just remembering them. MacColl was spot on when he used the 'quest ballad' as a theme. The transition from childhood into adulthood is typified by a need to establish independence, identity and a sense of meaning in the world around you. These things never change, no matter what climate or culture your generation finds itself in. The makers of this Radio Ballad heard this and responded to it with an empathy entirely appropriate to the culture of the time. Things have changed since then, the language and the symbols of youth culture are different, but the nature of the experience, the roots of the quest, are the same. As a child of the same times as the young people heard in On The Edge I am tremendously grateful to Bob Dylan and the iconoclasts who told me I could change the world. They gave me an environment, which I found very exciting, in which to conduct my experiments, make my mistakes and find my truths. As a fifty-year-old teenager I am just about at ease with the notion that young people may need to overturn the obstacle of tradition to make the world anew for themselves, whilst at the same time finding in that tradition the root which helps to make sense of who they are. No mean trick that, but for me On The Edge, and indeed the Radio Ballad form generally, found the way to allow perceptions of the human condition and traditional ways of expressing them to assist in the articulation of, apparently, modern concerns. Would this recording work for young people today? Unfortunately, I doubt that it would work for the majority, although I certainly intend to play it to some. Perhaps the world in which their voices are loud is just too loud, generally, for this. Real voice radio documentary comes a poor second to docu-drama or docu-soap on TV in which the musical context is a high-octane replacement of Seeger and MacColl's work. Who knows, though - if you watch closely and listen carefully, the same rules may apply. I found On The Edge a delight, even though, or perhaps because, there is a gentle sympathy in the musical arrangements which seems to advise you not to expect too much. There is a poignant moment, at least for me, towards the end when the words of a song say " ... Here where we walk, we plant our flag and claim our world. Here in our father's barren ground." A father now and a teenager then, I hope that is not entirely true. Perhaps a good listen to On The Edge every now and then will help to avoid creating too much barren ground. It might be the second best thing you could do. The best will be to talk to young people and really listen.